Paleo Chicken and Kale Stew Recipe – 5 ingredients only! – Jen, Jo, and Paleo! A twenty-something couple learning, cooking, eating, and growing together. 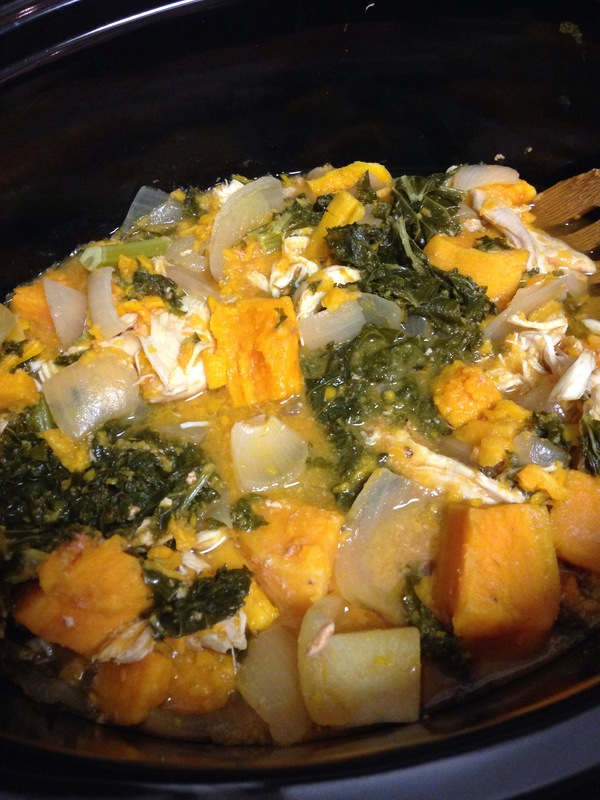 November 18, 2014 jenjoandpaleoLeave a Comment on Paleo Chicken and Kale Stew Recipe – 5 ingredients only! 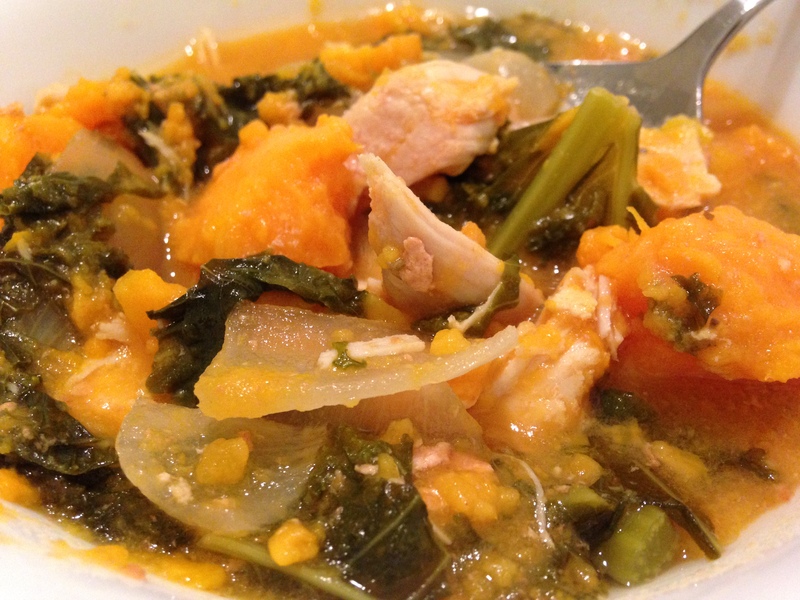 Paleo Chicken and Kale Stew Recipe – 5 ingredients only! 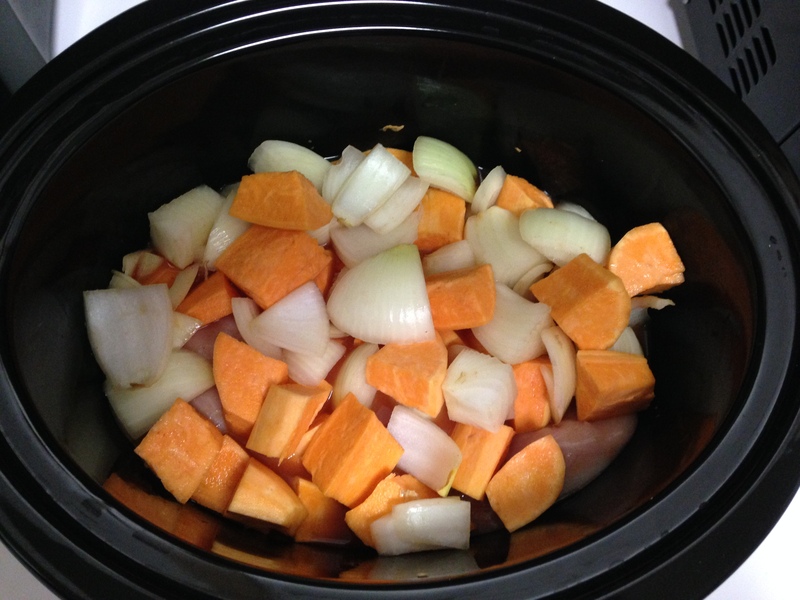 Winter = perfect crock pot season (click here to purchase the crockpot we have). Okay, to be honest, every season is perfect crock pot season, but there’s something about winter that makes you thinking of a simmering stew in a crock pot ready and waiting for you when you get home from a long day at work as pure bliss. I found this recipe while trying to browse easy crock pot recipes that were paleo-friendly. Thank you to 5 Ingredient Paleo for the recipe!!! This recipe caught my eye because it only called for five ingredients! Yes, count that, FIVE ingredients! It’s also incredibly easy on top of that. You simply throw the ingredients in the slow cooker, turn it on, and let it go. That’s what I love about crock pots/slow cookers, one of the best kitchen tools for lazy cooking. Throw in the ingredients in the morning, go to work, and when you get home you have a meal ready for you. No fuss, no muss. So, let’s get started! Simply throw all of the ingredients except for the kale in the slow cooker, add your cup of water and tomato paste, and then stir to incorporate everything. You do not need to chop up the chicken breast because they will shred easily once cooked in the slow cooker. I added a dash of basil and rosemary. I honestly don’t know if it did anything, but the dish turned out well in the end. I think you can definitely play around with the ingredients by adding different seasonings/spices as well as other veggies as well (carrots? white potatoes? possiblities are endless!). Chop all ingredients (except for chicken) and throw everything in the slow cooker (minus the kale). THAT’S IT! The recipe from the original blog post calls to cook everything on low for about 6-8 hours. And the in the last hour of cooking, open your slow cooker (slowly), and once again stir to mix everything up. The stirring should then shred your chicken easily. Add in the kale, and mix until well incorporated. Cook for about 30-60 minutes longer until the kale is tender. After adding the kale and mixing to incorporate everything. I was a little pressed for time, so I blasted the slow cooker on high for 3-4 hours. I then switched it back to low for another hour, threw in the kale, and then blasted the slow cooker on high for the last hour. The chicken was not as easy to shred, but it was still shreddable with some prodding and poking on my end. And voila! The stew turned out fantastic. Perfect dish to warm us up on a cold evening! Piping hot bowl of chicken and kale stew. YUM. Seasoned Ground Beef/Chicken/Turkey – Easy MEALPREP Recipe! Feel free to enter your email address to follow our blog and receive notifications of new posts by email!